Don Coryell was the best coaching hire in St. Louis Cardinals football history. 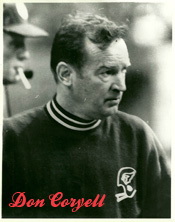 On Jan. 18, 1973, the football Cardinals, responding to an unsolicited letter, hired Coryell to be their head coach. An innovator known for producing winning college teams and high-powered offenses, Coryell overcame his lack of NFL experience and transformed the Cardinals into a championship-caliber club. In five seasons (1973-77) under Coryell, the Cardinals posted a 42-27-1 record and twice qualified for the playoffs. Those were the Cardinals’ first playoff berths since 1948 and their first division titles since moving from Chicago to St. Louis in 1960. Few predicted such success in January 1973. The Cardinals had finished the 1972 season with their second consecutive 4-9-1 record under head coach Bob Hollway. They ranked 23rd in scoring in the 26-team NFL. Former Big Red head coach Jim Hanifan and a few stars from yesteryear spoke at today’s National Football Foundation Luncheon at Lombardo’s Restaurant in St. Louis. Hanifan along with former players Johnny Roland, Tim Van Galder, Irv Goode, Eric Williams, and Bob DeMarco talked about their careers in St. Louis and the differences in today’s game and the one they played in the 1960s and 1970s. Former Big Red Pro Bowl center Bob DeMarco recounted playing at old Busch Stadium (Sportsman’s Park) and how fans in the temporary bleachers would offer the players some bourbon on cold Sundays in the mid-60s.